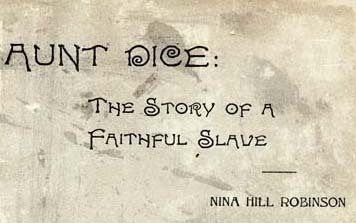 Nina Hill Robinson Aunt Dice: The Story of a Faithful Slave. Nashville, Tenn.: Publishing House of the M.E. Church, South: Barber & Smith, agents, 1897. African American women -- Tennessee -- Biography. African Americans -- Tennessee -- Social life and customs. Women slaves -- Tennessee -- Biography.